We hope, where super-hero movies are concerned. It’s all we can do. They’ll keep coming in waves and “phases” and reboots until we’re all moldering in our graves, raking in buckets of cash no matter their quality, and so we hope. We latch on to that thing that the symbol on Superman’s chest is supposed to represent, because we know these movies don’t have to be any good to keep coming. They just have to be. 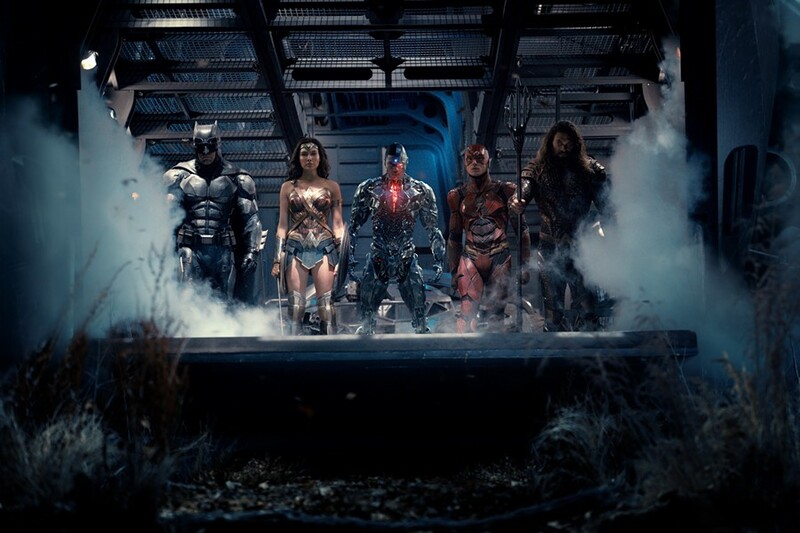 Justice League feels like an attempt by the DC Cinematic Universe creative braintrust to learn some lessons from Man of Steel, Batman v Superman: Dawn of Justice and Suicide Squad, and actually make a better movie. That apparent effort, unfortunately, only makes it all the more frustrating that it’s only okay. Though it was perhaps inevitable that it would feel Frankensteined together—being the product of director Zack Snyder’s original vision combined with the reshoots overseen by Joss Whedon—it’s even more of a jumble than that. Like that vintage Simpsons episode in which TV producers get a mess of contradictory suggestions from a roomful of test-audience children, Justice League appears to want to incorporate a response to every critical comment, even if those responses don’t make any sense together. The broad strokes of the premise might even have been provocatively thoughtful, had anyone followed through on its potential. In the aftermath of the death of Superman (Henry Cavill) in Batman v Superman, the world seems a dimmer and more chaotic place; a brief scene of a hate crime taking place outside a Muslim-owned grocery store hints at this narrative’s whispers of our own time, and our desire for some symbol to bring us optimism rather than fear. Superman’s absence also becomes an invitation to a villain called Steppenwolf (voiced by Ciarán Hinds) to revisit his centuries-old plan to remake earth in his apocalyptic image, which involves reuniting three powerful objects because what would a super-hero movie be without someone trying to get a powerful object. The arrival of Steppenwolf is the warning sign Batman (Ben Affleck) needs to realize that it’s time to reach out to Wonder Woman (Gal Gadot) and form the team that can do together what none of them can do alone. Hence it’s time to introduce Aquaman (Jason Momoa), Flash (Ezra Miller) and Cyborg (Ray Fisher)—which is a narrative burden that The Avengers didn’t have after pulling together characters all of whom had appeared already in other features. The screenplay—credited to Chris Terrio and Whedon—has to shoehorn in the backstory for all of his new players, so that we understand Aquaman is a hothead with some sort of mommy issue, Flash is an amped-up kid too focused on the plight of his unjustly imprisoned dad (Billy Crudup) to fulfill his potential, and Cyborg is bitter and confused over the merging of his personality with a constantly-evolving electronic intelligence after his near death in an accident. That’s a lot of weight for a two-hour movie to carry, and it’s amazing that it’s at least modestly successful where Flash and Cyborg are concerned; Aquaman is a befuddling mess salvaged only by Momoa’s strutting attitude. But Justice League also tries to add some levity to the proceedings, most of which is given to Miller, playing Flash as the analog to Tom Holland’s Spider-man who’s inexperienced but just enthusiastically really glad to be part of the team. The success of this summer’s Wonder Woman appears to be reflected in the heavy load carried by Gadot—who gets at least a dozen shots in a hero pose before she rushes into battle with a resolute slight tilt of her head—and an elaborate set-piece on the Amazon island of Themyscira. Perhaps addressing the earlier Superman-centric films’ nameless and faceless destruction of populated areas, we need to spend time with a Russian family trying to survive near Steppenwolf’s base of operations. Maybe somebody really liked the Quicksilver scenes in the recent X-Men movies, so Flash gets his equivalent here. And somewhere along the way, any notion of this story being about the re-birth of hope is lost until the coda, when it feels obligatory rather than integrated. It’s almost not worth griping at this point about what a crappy villain Steppenwolf is, merely the latest in a long line of haughty megalomaniacs against whom heroes must pit their might. There’s nothing new or interesting about his motivations or his plan, and it’s exhausting to wade through a bunch of fight sequences—even ones with a bit more visual and special coherence than Snyder usually delivers—to get to the resolution. Most of what works about Justice League is the mere satisfaction of getting all of these characters together, and enjoying what individual performers like Gadot and Miller now bring to that union. There’s a bit more fun to be had with the action, a bit more comedy and a bit more delight in what super-heroes can do. Mostly, there’s a vibe that Justice League’s failings are a result of trying too hard, rather than not trying hard enough. That’s something, anyway. That’s a reason to hope.